Blair Williams: "I consider myself a steward of this great institution that Steve Gibbs created." It was something akin to fate that led Blair Williams to her current role as owner of one of the Inland Northwest's most renowned fine arts institutions: The Art Spirit Gallery. Sitting inside the downtown Coeur d'Alene gallery, where a solo showcase of Spokane artist Mel McCuddin's work extends up to the ceiling on the walls around her, the North Idaho native recalls the series of events that began when, at 19, she became a volunteer board member for a local arts organization. "I so fell in love with the work," Williams recalls. "That was in the late '80s in Northern Idaho, and I was young and convinced that you could volunteer in the arts all day long, but you couldn't get paid to work in the arts." Soon after discovering this passion, Williams went on to study arts administration, though she didn't make her way back to Coeur d'Alene until 38 years later. She'd always planned to come home. "I have this distinct memory... I was driving down Sherman [Avenue] and having a conversation with God," she remembers, noting that this occurred right before she moved to California. "I said 'I'm leaving Coeur d'Alene and you have to promise me I'm coming back someday, because I love Coeur d'Alene and this community. But you have to let me work in the arts, and it has to be downtown.'" 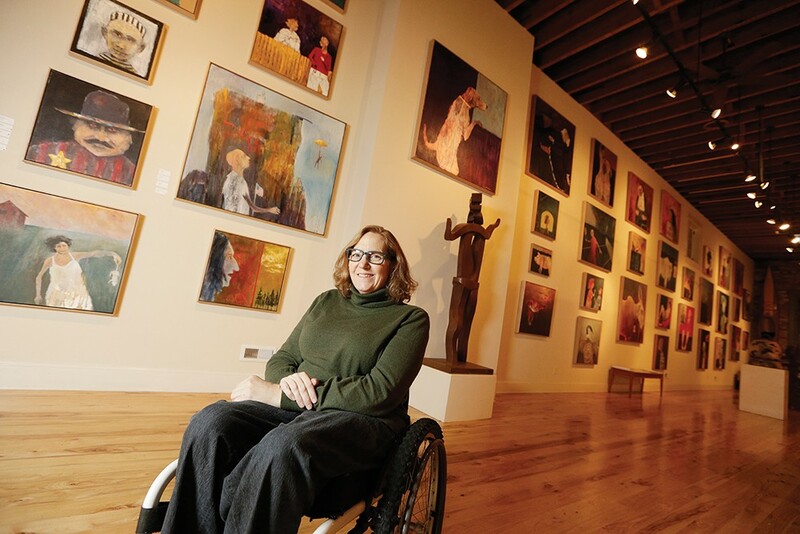 Williams was hired at the Art Spirit in 2013 by the gallery's founder and owner Steve Gibbs, who passed away in 2016 due to amyotrophic lateral sclerosis (ALS). Despite what she recalls as terrible interview on her part, Gibbs brought Williams on as gallery manager, and to help him transition into retirement and move the gallery forward. Little did they know Williams would also own the gallery just a few years later. "The plan we'd set forth was to develop a collaboration with the University of Idaho in hopes that the gallery would be turned over to them as a teaching institute," Williams recalls. "Steve would remain on as a curator and would still own the building, and it would be a win-win." Then came Gibbs' diagnosis, in mid-2016. Williams wanted him to sell the building to help pay for his healthcare. To their surprise, however, a friend stepped in and offered to buy the gallery building, under one condition. "They said 'We want to buy the building, but only if Blair takes over the business,'" she says. "And I looked over at Steve and he began to cry, and I said, 'I'm in,' and that's how it moved forward." Filling Gibbs' shoes and carrying the Art Spirit's torch forward has been a honor for her since. "I consider myself a steward of this great institution that Steve Gibbs created," she says. "I still know his standards and try very hard to keep those standards alive. At the same time, he brought me on because he knew the industry of galleries, and art in general, was changing as society and culture is changing... Younger people are more interested in experiences than things, and the world of technology is changing the way people view and experience art." Under her guidance, Art Spirit remains deeply committed to Gibbs' original mission to provide a venue for dozens of regional and professional artists to showcase and sell their work across all media — painting, sculpture, photography, woodworking, ceramics and beyond. But Williams is simultaneously seeking ways to honor the evolving wants and needs of the gallery's many stakeholders: artists, patrons, the community, would-be art buyers. That includes working on the previously envisioned collaboration with the University of Idaho, now called the Arts Education Collaborative, which will teach students the business side of the arts. The program seeks to partner with local businesses, projects and people to carry out this goal, which will eventually culminate in both bachelor's and master's degree programs in arts administration. Other nontraditional avenues to extend Art Spirit's reach include experimental programming and events, and even the development of a virtual reality project to aid art curation. Williams is also working on a collaboration with 10 other galleries across the Northwest to help artists reach wider audiences. "We have phenomenal artists who may have saturated the market here, and that doesn't mean they aren't awesome and I don't want to build an audience for them," she explains. "But if I have a connection with another gallery in another region, I can push them to build an audience there. It's cultivating a larger field." In Coeur d'Alene, Williams is reaching new arts patrons, community leaders and innovators by opening Art Spirit's doors to host all kinds of events — press conferences, fundraisers, volunteer receptions and awards presentations — for local groups at no cost. "What we're calling it right now is an urban grange hall," she says with a smile. "If we can share [our space] with you to celebrate what you're doing to build and strengthen our community, we are more than happy to offer that to you." The proven economic impact that the arts bring to communities of all sizes is a major motivator for the gallery owner as she continues seeking out new outreach avenues. "It's not just the feel-good, added value of decoration or emotion," she notes, pointing to an example in Colorado, where the economy of the state's arts and culture sectors now outpaces state GDP in mining, transportation, and agriculture and forestry. "Innovation happens on a daily basis in the arts world, and that innovation sparks subsequent innovation" in other sectors, she continues. "I hope we here at the gallery are able to educate and promote that in the business community." Only buy art that speaks to you. "It has to move you and be something that, every morning when you pass it, it brings you some kind of joy or a smile on your face." Know your art budget, and seek out reputable dealers or galleries when buying artwork.